On behalf of Cindy and myself I would like to wish you, our wonderful readers, a very happy holiday season. May you all have a safe and wonderful celebration whatever that may be for you and your families. You have all been great company over the last year and we look forward to sharing lots of decluttering wisdom again in 2012. Hi Colleen and Cindy I hope you and your families have a wonderful and magical holiday season. Stay safe (Liam). Thanks for all the terrific tips this past year. And to you both and all the commenters, a very merry christmas!! Havn’t been around a lot, real life taking over, look forward to a simpler 2012! Merry Christmas Colleen and Cindy. 365 less things is the only blog I have delivered direct to my email which I think says something about the quality of the writing. Well done! And here’s to a great and decluttered 2012. Colleen and Cindy – here’s wishing you and your families a lovely Christmas. Thanks for all your help and encouragement. Merry Christmas to both of you and your familes. Looking forward to 2012 with 365things. God bless you both. A very happy Christmas to you Colleen and Cindy: thanks for all your hard work. And Liam – stop it! And thanks to all the contributors that make this a great blog community. Merry Christmas to you and Cindy, Colleen. Your blog is always a source of inspiration and entertainment. Look forward to seeing what you come up with in the new year. Merry Christmas from New Zealand, to you both, and to everyone who contributes here. Merry Christmas to all from Montana! Very merry Christmas to all of you too from Germany . wherever you are, however you celebrate. i wish you all the best for the next year. Another merry Christmas from New Zealand, your blog is my favourite and I appreciate the effort it must take to write it and put the pics in five days a week plus one from Cindy. Enjoy the time with your families and friends. Now… back to the kitchen! To all our lovely readers who have sent in Holidays Wishes thank you very much. You are the great community that 365 Less Things has become. Happy holidays to all, and many thanks for such a lovely forum! Thank you sumarie. 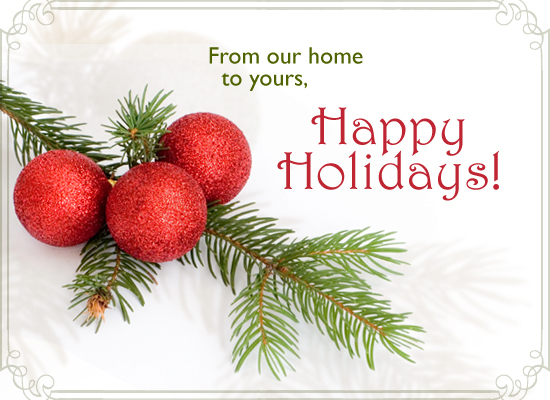 All the best to you for the holiday season. Best wishes to Colleen, Cindy and all the commenters here. This blog has made such a difference in my life. Thank you for that.